When talking about chin surgery, most people think about how to make their chin bigger through chin implants or fat injections but an equally significant thing to consider is how to tone down an overly prominent chin. Under this category, one common procedure for when it comes to chin enhancement is how to correct an excessive, deep chin cleft. Before discussing how to correct a chin dimple, let us first talk about what causes it in the first place. Many people think that a cleft chin is associated to how the chin bone looks. 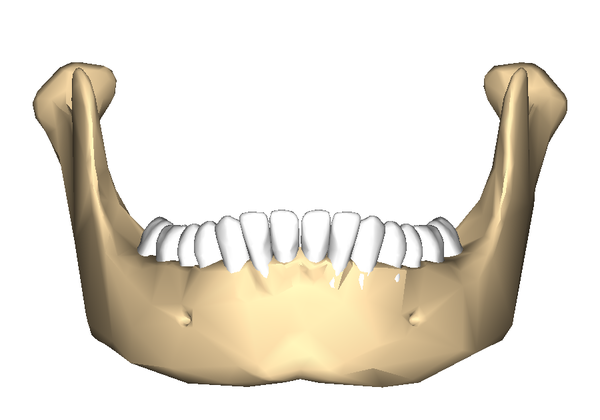 Below is an image showing what the chin bone actually looks like. Having a prominent cleft chin is believed to have a deep indentation in the middle of the chin bone, but it turns out that the chin bone usually have that prominent groove. The truth is, the mentalis muscle, the muscle that appears around the jawbones, fails to close at the chin, hence leaving a gap. People with cleft chin have either a very thick mentalis muscles that create a ‘valley’ between the muscles, and/or a wide space between mentalis muscles. Is a Cleft Chin Attractive? People have different views on the cleft chin. Some feel it improves a person’s appearance while others find it ugly. A cleft chin is technically regarded as a flaw but numerous popular celebrities who have this facial feature are considered attractive and good looking. Unlike cheek dimples, which represents youthfulness and innocence, a chin dimple is regarded by most women as contentious as they think having such is more masculine than feminine. There are a number of ways to enhance the appearance of the deep cleft chin. One of the most popular and most straightforward ways is to use dermal fillers to fill in the chin dimple. This can be done quickly in the doctor’s clinic and only takes a few minutes. Dermal fillers such as Juvederm, Restylane or Radiesse can be used. However, this method is not permanent. This requires repeated application and may last from 6 months to a year. There are permanent treatment options available which includes changing the chin bone itself or addressing the separation of the chin muscles surgically. One important thing to consider is that it’s too complicated to completely alter a very prominent cleft chin through surgery alone. This is because it’s important to avoid changing the chin when working with the chin muscles. The goal is to have a natural looking and subtle chin result. Hence, surgeons are limited to how they can modify the chin muscles toward the midline. The most dermal fillers can do for cleft chin is to make it less visible. It is impossible to eliminate chin dimple even with surgery. But there are other ways to hide It. Women can use makeup to make it less obvious. While men can gro beard to hide the gap between their chin. What Happens After I Get Dermal Fillers? You are done with your dermal filler procedure? Now, what’s next? What will happen? How long will this last? These are only a few common question you may ask after you got your dermal filler injection. Read below to know what to expect right after the treatment and what happens during healing. After the procedure, expect to have slight bruises and mild pain on the punctured marks for a few days. The pain should diminish after a few days but you can take pain relievers if you feel uncomfortable. The best way to minimize the pain is to try not to move the face but not talking too much, twisting your face or straining your eyes as the muscles are still weak and the injected area will only further aggravate the pain. Simply wash your face with soft luke warm flannel as warm application increases healing process by speeding up blood flow. This will also keep your skin fresh and moisturized. The longest duration you’ll experience pain is up to a week or in rare cases, up to two weeks. Take note that the improvements on your face – the wrinkle-free face; softer, smoother skin and the overall sense of youth won’t last forever. 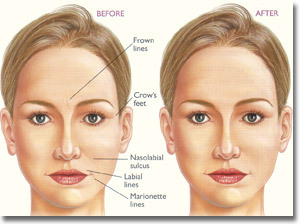 Dermal filler usually last up to 6 to 9 months and thereafter, you will need a follow-up injection to maintain the look. After getting the procedure, you will directly notice and feel a more toned, less wrinkled skin. This will become more pronounced in the next 24 hours after the procedure. After eight hours following the procedure, you will notice your skin tightening, with wrinkles filling in. Also, be ready as your skin will start to have mild swelling, with slight bruises and redness, especially in the areas that were treated. But don’t worry, as these will pass after a few days. The dermal filler treatment can last between 6 to 9 months, without the need to use any products to lengthen its potency or effect or protect the treatment. Of course, the effect will still depend on the patient’s skin, the type of dermal filler used and the competence of the cosmetic surgeon or aesthetic specialist. After 6 to 12 months, the effect of the filler will weaken until your skin goes back to its pre-treatment appearance. The reason why it diminishes is because the skin is not designed to hold the filler substance or collagen under the skin once natural collagen degrades. How Long Can I Have the Filler Treatment Again? The dermal filler treatment can be administered any time the effect of the previous treatment has degraded. On average, you will get once every nine to 12 months. Your aesthetic practitioner can inform you when you can go back for re-treatment. It is important to consider if you need more treatment as this situation can fall into a routine – a cycle of getting the procedure every nine months because this can lead to an undesirable wear and tear on your skin.